Pretty much two of my favourite things! 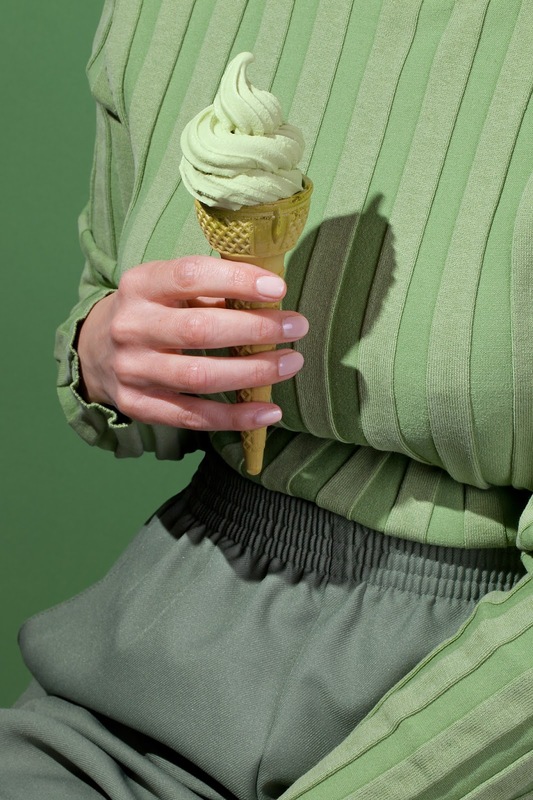 I find these images of snacks matching the outfits; a series named Wardrobe Snacks by Kelsey Mc Kellan with stylist Michelle Maguire, strangely soothing for the eye and mind, partly in the sense that they somehow are very reminiscent of my childhood. Must be the hues and the polyester, early 80's. I mean is there anything more 80's than that cardboard like waffle cone? Those (and they are still around) were the only ice cream waffles back in the days. And that shade of ice cream - pear ice cream. An instant childhood boost for me. You might have heard this story before, but we were in Heikintori in Tapiola with my mother and now late grandmother and it was warm and sunny and I got a pear ice cream and then my 9-month pregnant mother's water broke and we had to rush away and I did not get to finish that ice cream. Or so my almost three-year old's brain remembers it, the day my sister decided to arrive; a half eaten pear ice cream. Find all of the prints here.